Pizza for dessert? Why not! 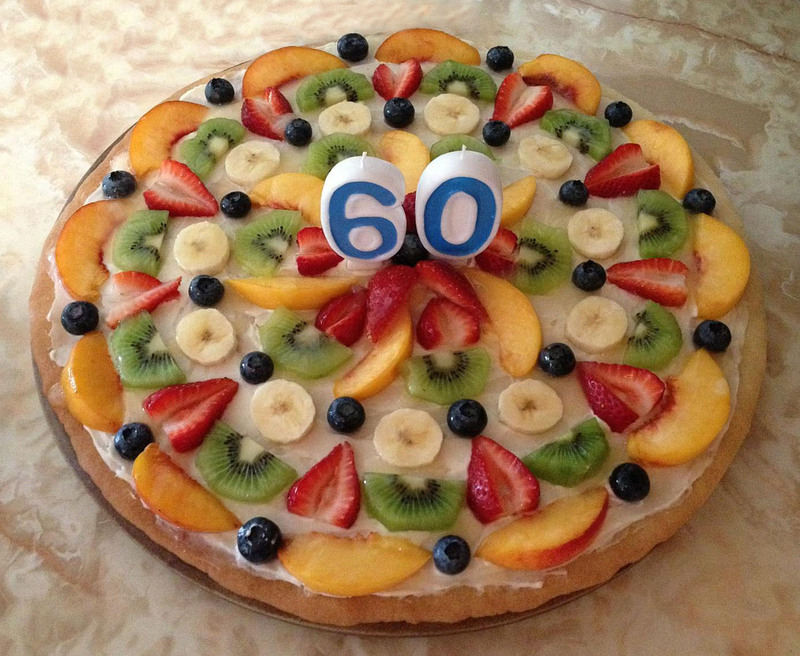 For my mom’s 60th birthday recently we made fruit pizza rather than a traditional birthday cake. It’s the perfect time of year for this delicious dessert as there’s lots of fresh fruit available. And this is a great way to incorporate some fruit into your dessert. 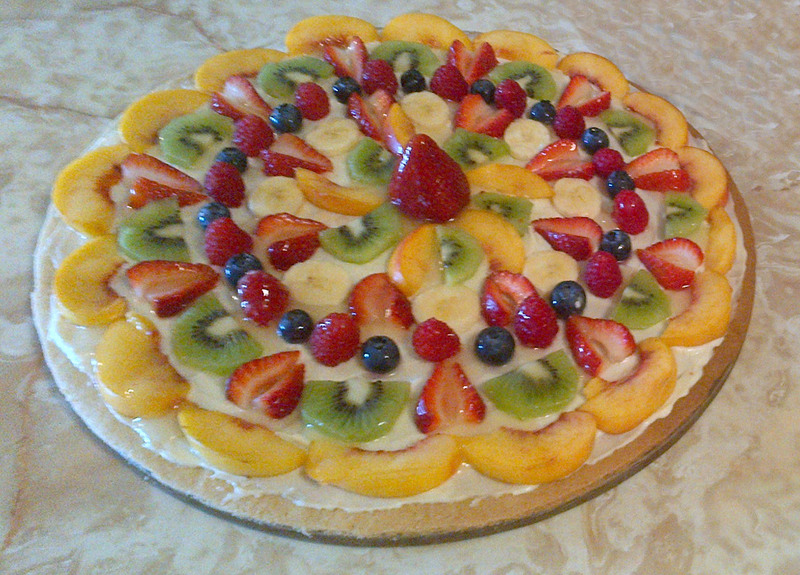 For our two fruit pizzas we used kiwi, peaches, bananas, strawberries, raspberries and blueberries. Using different coloured fruit makes the pizza more colourful. I also encourage you to experiment with the fruit design on your pizza. You’ll notice in the photos below that my two designs are slightly different. A tip: allow yourself extra time to cut up the fruit, if needed, and place it on the pizza in a design. It can be a bit time consuming. For the crust, we used a simple sugar cookie dough recipe. Please note that this recipe makes two large fruit pizzas in pizza pans (we used Pampered Chef stoneware). Combine sugar, margarine, vanilla and eggs. Beat until fluffy, then add the dry ingredients: salt, baking soda, baking powder and flour. Shape into two balls for two large fruit pizzas. Spread onto pizza pans. If you’re making only one pizza, make 1/2 of this recipe. Bake at 350 F for app. 10 minutes. Allow crusts to cool. For the icing, we mixed one 250 gram package of cream cheese and approximately 1/2 cup sugar. Spread a thin layer over pizza crusts. Arrange your fruit on the pizzas. For the glaze we boiled apple juice, cornstarch and sugar. Allow it to cool and then drizzle it over the fruit. Enjoy!